Today’s post is a guest post by Jan Weir, a Barrister from Canada who specialises in Banking and Fraud and who also teaches Business Law at the University of Toronto. On many occasions here in Financial Regulation Matters, and in fact in society in general, we discuss elements of society that have been directly affected by the Financial Crisis, but only mention the Crisis in passing. Whilst this is not done to reduce the understanding that the Crisis devastated society, the passing time has allowed for the actual causes of the Crisis to become so engrained that they are rarely discussed anymore. So, in this guest post, Jan Weir helpfully provides a reflective account to discuss some of the underlying causes to the Crisis so that we can bring them back to the forefront of our thinking when assessing current events – the underlying sentiments and motivations have not changed. As absurd as that sounds when put in a simple sentence, that is what a vast majority of Americans actually believe. It is an example of what must be the most successful propaganda campaign of modern vintage­— accomplished by Wall Street, of course. (Then) New York Mayor Michael Bloomberg quite clearly demonstrated this propaganda when at a business breakfast in Manhattan in 2011 he said: ‘It was not the banks that created the mortgage crisis. It was, plain and simple, Congress who forced everybody to go and give mortgages to people who were on the cusp… They [governments] were the ones that pushed the banks to loan to everybody. And now we want to go and vilify the banks because it’s one target, it’s easy to blame them and Congress certainly isn’t going to blame themselves’. Yet, if we are to understand how the banks engineered and covered up a blatant mortgage application fraud, then we must go back to 1938 and look at the founding of Fannie Mae (Federal National Mortgage Association) and its siblings, although we will cover these later on. During that period, the Government wanted to help the working class buy their homes. To do this, the Government developed a plan whereby Fannie Mae would lend based upon standards that we are all familiar with from the banking sector – job history, a salary four times the amount of the monthly mortgage instalment, a 20% down payment, and so on – but with one crucial difference; its mortgagors could have a 5% down payment instead. Other than this, Fannie Mae was to have the same lending standards as their banking colleagues; because of this, Fannie Mae mortgages became known as ‘conforming mortgages’ because they conformed to its standards. However, we need to keep this term ‘conforming mortgages’ in mind because if we read any analysis of the Financial Crisis and ‘conforming mortgages’ are not mentioned, then it is likely that the author, however well intentioned, has been influenced by the bankers’ propaganda. In terms of reality, these strict lending criteria at Fannie Mae were never, never lessened! However, on the back of this development came a brilliant idea which was that Fannie Mae would buy mortgages from private lenders that met her standards, with the private mortgage companies and commercial banks being at the forefront of this new system. In essence, Fannie Mae would buy the mortgages, package and sell them to wealthy investors with an implied guarantee that she would pay if the mortgagors did not. Then, in an example of how titles and symbolism come into play, those mortgages became known as ‘conforming mortgages’ because they conformed to Fannie Mae’s standards, even though they had originated elsewhere. Why was this a brilliant idea? It was brilliant because it removed the risk from the Banks’ books and this in turn allowed them to create more and more mortgage loans so more and more low-income people could buy homes – and the private lenders got their profit up front. The investors targeted were not after massive profits from their investment – they could afford not to. What they did want, however, is to have their investment protected, which is why investing in government-backed subprime mortgages was as safe as investing in Treasury Bills but with a few more percentage points – great! But, if this was the case, there should not have been a Crisis at all – it is at this juncture that we are introduced to the NINJA loan; the No income-no job-no assets loan that, even just by looking at the title, clearly did not meet Fannie Mae’s standards. In order to understand this more, we need more background. Packaging these mortgage loans together is one type of a derivative. 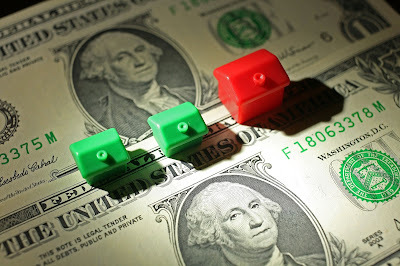 A derivative means that the investment derives its value from another investment – in this case, underlying mortgages. That package, or derivative, would then be sold under another name (Abacus 2007 AC1, for example). These derivatives were a massive hit with investors, mostly because there were almost no defaults. Fannie Maw was successful in providing the working class with homes they could not have otherwise have afforded, and the whole system was highly profitable for the Government, and the private parties. However, whilst the process looks extremely positive, we know from hindsight that this was a façade that would cause great destruction, so it is worth looking at this packaging process in more detail, and to do that we need to go back to the 1980s. In the 1980s, an investment banker at Salomon Brothers – Lewie Ranieri – decided that he would package prime mortgages, certify that they were indeed prime mortgages, and sell these packages, or derivatives, to wealthy investors. Both the private derivatives and the government-sponsored derivatives proved to be wonderful investment opportunities, and this confidence then allowed for a confidence in the mortgage-backed security as an ideal – the market for them exploded! The investors hungered for the derivatives, and so Fannie Mae and the investment banks gladly supplied. But, at some point, the investment banks started to mix the prime mortgages with mortgages which were certified to be the Fannie Mae-level conforming mortgages – at the beginning, they probably were – but soon these mixed bag mortgage derivatives also gained the same confidence from the marketplace, which in turn drew in the real heavy-hitters; the institutional investors. Predictably, the demand increased to a point where the commercial and investment banks ran out of supply – there simply was not enough people meeting Fannie Mae’s standards. It is at this point that mortgage broking standards deteriorated rapidly, with any warm body capable of signing their own name signed up to the process (in some cases, like the 23 in Ohio, the mortgagor didn’t even have to be alive!). If we return to the NINJA loans from earlier, an important point to raise is that the lenders were charged with checking the applicant’s background and certifying that they met Fannie Mae’s lending standards, but at both commercial and investment banks, employees forged, or knowingly approved forged applications so they would appear as if they met the lending standards – the NINJA loans subsequently became, to all intents and purposes, ‘conforming mortgages’. To supplement this, the lending banks had lowered their standards so that they now represented predatory lenders, with the process being to lure applicants into signing for mortgages on the basis of a 3% rate that would jump to 6% in two years. Perhaps the best dramatisation of this so far has been Michael Lewis’ The Big Short, which portrays the environment before the Crash in which his antiheroes saw the dates that the higher rates would kick in as an indicator of a systemic crash, and who subsequently ‘shorted’ the market to reap the rewards. Lewis showed one of his main characters, Mark Baum (played by Steve Carell), knocking on doors discovering the mortgagors’ NINJA qualities. The only factor Lewis missed was the role of lending standards; these NINJA loans did not meet lending standards! So how did they get approved? Shorting the housing market is pure gambling. It means betting that the housing market will fall. Many of the investment banks took that bet to the tune of billions of dollars. When the higher rates kicked in and the market collapsed, the investment banks were bust and had to appeal to the Government for bailouts to pay the wealthy hedge fund investors. This was probably the biggest, fastest, most direct transfer of wealth from the pockets of the middle- and working-classes into the bank accounts of the wealthy in history. Were there whistleblowers? Were there employees along the way who raised the alarm? Yes, but that will be the focus of future posts. Jan Weir is a Barrister who specialises in Banking and Fraud and who also teaches Business Law at the University of Toronto. Jan’s practice can be found here. Please do also follow Jan’s posts from his Twitter account @JanWeirLaw and his Medium account here. Contributions are welcome to this blog. If you would like to contribute regarding any area of financial regulation, then please feel free to email me and submit your blog entry. The content should be concerned with financial regulation, and why it matters, but this is broadly defined. The blog is open to all who are professionally concerned with financial regulation, which may range from an Undergraduate Student interested in writing on the subject, to Professors and industry participants. The views expressed in this blog represent the personal views of the author only, and in no way represent the views of any institution that the author is affiliated to.